I had this salad at a family reunion for the first time this summer. I was skeptical for two reasons- 1) I don’t like raisins and 2) I don’t like anything that resembles miracle whip. Boy, was I wrong! LOVE THIS SALAD! So did the hubby. He said, “This is pretty good for fruity food.” Yep. That’s a compliment. Fry the bacon until crispy. Drain on a paper towel, then crumble. Combine the onion, broccoli, and raisins. Pour over broccoli mixture, and toss until well mixed. Refrigerate for at least two hours. 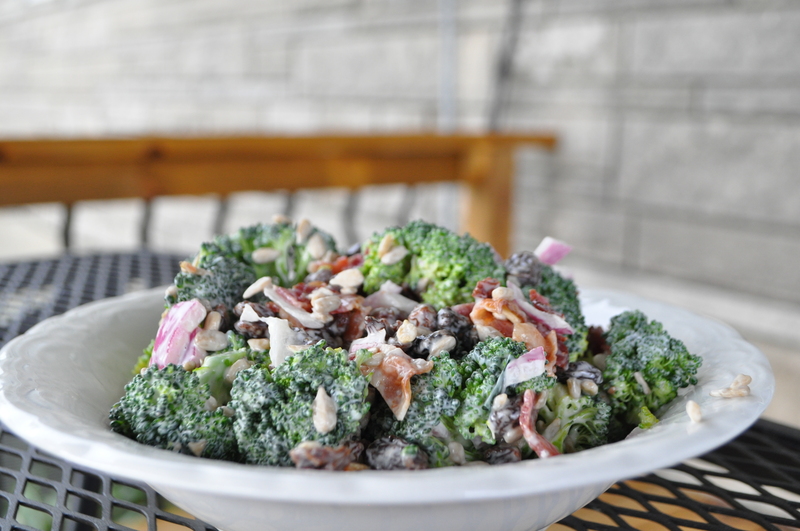 Toss the salad with crumbled bacon and sunflower seeds when ready to serve. Serves 6. I was just as skeptical as you for the same reasons…boy was I surprised when I tasted this several years ago 🙂 Yummy!!! I know! I love love love it! I really like it! Homemade mayo would be lovely. As would home grown broccoli. MMMM!! !